"There is no one right way to read a poem. Good readers vary greatly, and even the same reader rarely reads a poem twice in exactly the same way." Submissions must be sent between August 31, 2016 and November 15, 2016 and must be under 5 minutes in length. To be considered, the recitation must be of a work from the above list. Memorization is encouraged but not required. Finalists will be selected based on the quality of the recitation, but creativity will also be taken into account. The contest is open to college and high school students in the United States. Employees of Norton and their children are not eligible, nor are the children of Norton authors. Eligible submissions will be judged by W. W. Norton in-house editors, who will select finalists for each of the four works; the finalists’ recitations will be featured on the W. W. Norton website. 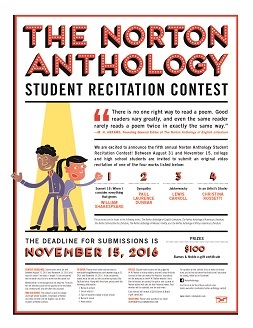 Once the recitations are posted, the public and a panel of Norton editors will vote for their favorite videos. Four winners will be selected, one for each work. Each winner will receive a $100 Barnes & Noble e-gift certificate. Please send questions via email (nortonanthology@wwnorton.com). For updates on the contest, lists of works to choose from, and to find out when the finalists will be posted for voting, follow us on Facebook! Please click here for official contest rules.